A rare non-fiction review from me today - I almost never review the non-fiction I read, but I'm making an exception here for Pretty Honest because it's such a welcome treat to combine my twin passions of books and beauty. Plus, I enjoyed it so much that I can't wait to talk about it. Most beauty books I’ve come across have been huge coffee-table affairs full of glossy photographs of iconic or avant-garde makeup looks. That’s all well and good, and I enjoy looking at those books as much as the next beauty obsessive, but there’s little in them that makes entertaining reading (rather than looking) and their ideas are fascinating but rarely attainable. 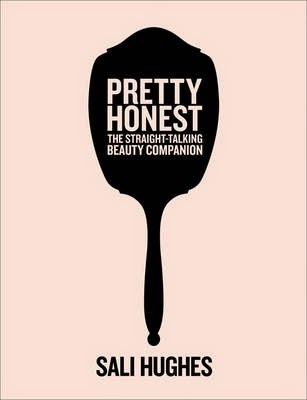 Sali Hughes’ Pretty Honest is a different kind of beauty book. Pleasingly chunky and compact, beautifully bound and printed on discreetly sleek matte paper, it’s more words than pictures, and it’s essentially a comprehensive collection of immensely readable essays on real beauty for real women. Pretty Honest recognises that beauty encompasses doing your makeup on the bus, covering troublesome zits, going mental with Barry M glitter when you’re 13, sprucing up your face for the (misnamed, as Sali rightly points out) walk of shame, and looking like yourself again after giving birth, having chemo or recovering from a serious illness. There is far too much writing out there that makes beauty seem complicated: this book cuts the crap and reminds us with refreshing frankness that it really needn’t be. You can apply your nail polish while shouting at Question Time and eating crisps; you can wear as much red lipstick as you want because frankly, why the hell wouldn’t you? Pretty Honest is a welcome reminder that beauty is fun and should be a treat, not a chore. There are loads of recommendations for looks, techniques, routines and products, plus welcome dismissals of beauty myths and pointless products – you can forget your restrictive ‘colour rules’ and bin your bust gel, for a start. But aside from the wealth of practical advice, what really makes Pretty Honest stand out is its enthusiastic celebration and robust defence of beauty itself, and the women who love it. Sali Hughes is very clear on the difference between beauty and the beauty industry, and I wholeheartedly agree that you can be passionate about the former without being uncritical of the latter. Anyone who has ever dared to stray into the reader comments on beauty articles on any newspaper’s website will be familiar with the criticisms that women (and sadly, it is almost always only women) face for expressing an interest in makeup or skincare. We’re shallow, we’re vain, we’re not spending enough time thinking about Syria and world famine, we’re being duped by advertising, we’re trying to ensnare men who prefer us without makeup anyway, we only need makeup because we’re not beautiful in the first place, we’re not Proper Feminists. All this is, of course, a pile of old guff, and Sali does a fine job of arguing against it. Pretty Honest is a book that celebrates the choice, individuality and creativity that comes with makeup, and recognises that women who love beauty – shock, horror – think about other things as well. The book’s analysis of what beauty can mean to women is also astute. Too many beauty writers talk to women as if makeup and skincare is something we should buy into because there’s something fundamentally wrong with the way we look without it, or because it’s the done thing to look a certain way. Sali Hughes simply doesn’t do this – she recognises that most of us simply want a face to fit the day’s mood or mindset, to look like ourselves at our best, to spend a few minutes doing something creative every morning in way that helps us feel confident and in control. I should probably point out that I wore makeup to have my gallbladder removed,* so obviously I’m someone who fully embraces beauty as an integral part of my daily life: my complete makeup collection fills six large washbags and that’s without skincare. I don’t, however, think you need to be anywhere near as into beauty as I am to enjoy this book – it would be a great read for anyone who likes the idea of makeup and skincare but doesn’t really know where to start, or feels stuck in a rut with their look, whether they’re a teenager or a grandmother. Beauty fans like me will love the whole ethos of this book, no question – but the sheer warmth, wit and enthusiasm of Pretty Honest, together with the no-nonsense clarity of its advice, makes it a brilliantly unintimidating, friendly read for the beauty novice too. Unless you are one of those people who thinks they deserve some kind of medal for undertaking all personal grooming with Swarfega, vinegar and a J-cloth, this is a book I'd highly recommend. * I wouldn't actually advise wearing makeup for major surgery. I woke up from the anaesthetic with mascara all over my face, and the nurses complained because my concealer came off on my oxygen mask. I should have done what my mum did for her mastectomy, which was go barefaced for the actual surgery and then edge her way to the bathroom upon waking in order to put her makeup on while still hooked up to an intravenous drip.